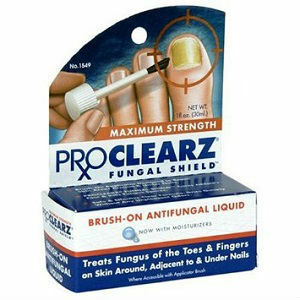 With a well-designed applicator brush and an anti-fungal liquid, ProClearz Maximum Strength Fungal Shield intends to cure the toes and fingers with fungal infection. The applicator brush is designed to apply the product around the affected area and under the fungal toenails or fingernails of the person. The product claims to cure the person’s athlete’s foot and claims to kill the toes’ or the fingers’ fungal infection. It rates high as an effective treatment to fungal infections. If the product irritates your skin and does not show sign of effectiveness within 4 weeks, you may see a doctor. There is no indication of dosages on each ingredient of the product. Its contents are composed of active and inactive ingredients. Tolnaftate is an active ingredient while acetone, aloe vera gel, propylene glycol, tocopheryl acetate, and water are inactive ingredients. Tocopheryl acetate or vitamin E is the most essential ingredient of the product because it leaves the skins smooth and scar free after its treatment. The fungal product should be properly stored under a room temperature of 15 to 30 degrees Celsius or 59 to 89 degrees Fahrenheit. You should shake the bottle before every use. Before the application of the product, the person should properly wash his toes or fingers with warm water and soap. After cleaning, it must be dried with a clean towel. Then you may start to apply the fungal liquid on the affected area every morning and every night. It ranges from $11.00 to $25.00 depending on the number of bottles that you are willing to purchase. For $11.00 you can buy 1 bottle of the product while for $25.00 you can purchase 4 treatment bottles. A guarantee of 60 days money back service is offered if the product is not as effective as it should be. The product should be effective within 4 weeks of use for a person with athlete’s foot and within 2 weeks or a person with jock itch. If irritation and no improvement occur within a month then you may return the product. It may be an effective treatment for fungal infections but it takes long before it could actually cure the affected toes or fingers of the person. Its high rating came from the good reviews and feedbacks of its previous customers. Most of them said that it is an effective fungal treatment and it does not contain any side effects. The only downside of this product is one of its ingredients, acetone. Because of it, the product must be kept away on any flammable places or hot areas to prevent accidents. Jack Stevens	reviewed ProClearz Maximum Strength Fungal Shield	on February 10th	 and gave it a rating of 3.